Despite being so close to the southern tip of Florida, the island of Cuba seems like a million miles away. The Communist country is a graveyard of classic American cars, with Havana being an urban hellscape of prostitutes, noisy cab drivers, and half-starved citizens begging for change. The only thing most people commend about the giant Castro prison-state is its healthcare system. Even that might be more illusion than reality. Robert Arellano’s Havana Libre provides an insider’s perspective of Havana and Cuba during the so-called “Second Period,” when Cuba had to readjust its economy after loans from the Soviet Union stopped showing up. The Second Period, or Período especial, meant average Cubans became masters of waiting in line for bread and milk, stretching a ration book for as long as it could go, and hoarding gasoline in order to make sure that their Soviet- and Chinese-made vehicles could circle the block. In the midst of this turmoil is famous Cuban doctor Manolo Rodriguez. Rodriguez is known throughout Latin America, Angola, and the other African nations that once housed Cuban soldiers because of the moon-shaped birthmark on his face (Havana Lunar). Like others in Havana in 1997, Rodriguez is just trying to scrape by while simultaneously retaining some faith in the socialist-Communist system. As a pediatrician, Dr. Rodriguez suffers more burnout than most, but Arellano depicts him as a humble human being with a deep fondness for human life. This humanity is rocked when a popular tourist stop in Havana is blown to smithereens by a terrorist from El Salvador nicknamed “Rambo.” Rambo tells the Cuban security services that the entire operation came at the behest of Cuban exiles living in Miami. They want revenge for a recent Cuban attack on an airplane carrying four anti-Communist rebels. Cuban officials tap Dr. Rodriguez as their newest recruit not only because he’s been invited to a medical conference in Tampa, but also because intelligence shows that one of the key terrorist ringleaders is Manolo’s estranged father. Havana Libre is a scenic novel that provides much in the way of the sights and sounds of Fidel’s Cuba. Contrasting these are the wealthy, yet thoroughly decadent streets of Little Havana in Miami. Although Dr. Rodriguez’s honesty and his clear-eyed view of the depravity of collectivist economics makes him something of an outsider in Havana, he is a stranger in a strange land in the United States. As good as Arellano’s descriptions are, this book is light on plot. Indeed, the whole international espionage issue is only dealt with in the last 100 pages or so. Similarly, the novel’s conclusion feels like an example of deus ex machina, while a subplot involving Dr. Rodriguez and a beautiful patient named Mercedes is completely unfulfilling. 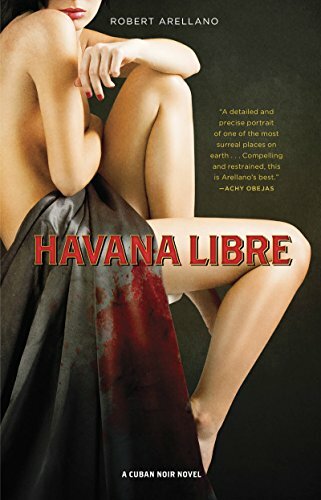 Havana Libre works well as a sociological commentary, but as a mystery novel or a thriller, it’s a dud.